It was the week before Christmas in 2004. The cold rain beat down on my car as I drove up the hill to my home in the woods. I almost didn’t see the dog tied to the tree stump. She sat stick straight, and never took her eyes off me as I got out of my car. 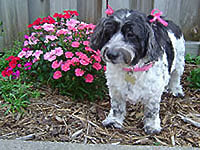 After speaking with her family I learned that Maya, an exuberant 80 lb. puppy, had been left with them by a relative no longer able to care for her. After bringing Maya treats, toys, and even a large dog house, it became clear what she really needed was a home. It took several weeks, but I was finally able to convince the family to release her to me. With the help of a local veterinarian, Maya was admitted into Project Pooch (http://www.pooch.org/) an organization in Oregon that pairs incarcerated youths at a correctional facility with dogs who need a little “behavioral assistance.” Maya eventually found her forever family, and is living the good life with two canine companions and a woman who adores her. When I first met Maya, the young children of the family brought me into their home and showed me a treasured Nativity set that sat on the bookshelf. I didn’t know it at the time, but that simple moment would become very meaningful in the days that followed the Christmas holiday. It was in the shower, on New Years Day 2005, that I heard a story being told to me about an old, chained dog, who wanted to leave the sadness of his earthly life and go to heaven. 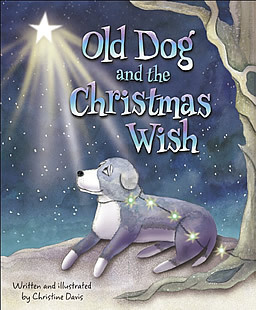 Thus began the story of Old Dog and the Christmas Wish, my newest book about a forgotten dog who sees the neighbor’s Nativity display on Christmas Eve and knows he has one more task to complete in the short time he has left on earth. It was Maya who inspired the story, but it is the spirit of my beloved dog, Jake, who I lost in June, that runs through the pages of this book. To Jake, who is flying through the starry skies…. may you never stop watching over me. And to Maya, who is finally running free….I offer a most heartfelt thank you! May your holidays be overflowing with peace, joy and of course…FUR!